An imaginative, diverse celebration of Australia’s iconic wildlife, the Perth Mint’s 2010 Discover Australia Dreaming Series represents a breathtaking work of numismatic art. Distinguished by an incredible FIFTEEN DIFFERENT indigenous art designs, this prestigious Australian legal tender series is sure to mirror the popularity of the first issue in this illustrious Australian collector program. As with the acclaimed 2009 release, the new 2010 Discover Australia Dreaming Series is available in stunning silver, glorious gold and prestigious platinum – with each series featuring different designs! Unique tributes to the Wombat, Koala, Platypus, Saltwater Crocodile and Frilled Neck Lizard, those designs are the work of noted indigenous artist, Darryl Bellotti, who has successfully used the art of coinage to bring Australia’s most ancient cultural traditions to life. Darryl’s designs are absolutely superb struck to the most rigorous Proof standards of the Perth Mint, and the new 2010 Discover Australia Dreaming Collections will undoubtedly command the attention of those from both the collector community and the art world. Defined by surprisingly small mintages – particularly given the world’s insatiable appetite for Australian indigenous art – this outstanding new Australian legal tender series is now available at Downies! A spellbinding synthesis of beauty, purity and presentation, the Perth Mint’s 2010 $1 Discover Australia Dreaming 1oz Silver Proof Collection is a stand-alone release of immense quality – and a must-have for those who secured the 2009 set! A truly spectacular, distinctively Australian presentation, this new precious metal collection comprises five brilliantly designed crown-size coins. Compelling, highly individual works of indigenous art, the five coins pay homage to some of Australia’s most internationally recognisable native creatures – the Koala, the Platypus, the Frilled Neck Lizard, the Wombat and the Saltwater Crocodile. Beautifully accommodated by the imposing 40.60mm expanse of these flawlessly struck .999 fine silver 1oz coins, Darryl Bellotti’s inspired one-year-only designs look utterly sensational when united with the Perth Mint’s unrivalled full-colour-minting techniques. Forming a fitting environment for such an eye-catching presentation, each 5-coin collection is housed within a plush, official Mint case with a timber lid, housed in a full-colour outer box. Completing the presentation, a numbered Certificate of Authenticity is also included, attesting to the strictly limited worldwide mintage of just 10,000 sets. The most affordable issue of the 2010 Discover Australia program, the ongoing global demand for Australian indigenous art in all forms will ensure enormous interest in this exceptional Australian legal tender presentation. Secure your collection at the Mint’s Official Issue Price! Worldwide mintage set at just 10,000 collections! Drawing upon the ancient traditions of Australian indigenous art, the Perth Mint’s new 2010 Discover Australia Dreaming Gold Proof Series is a masterpiece of precious metal minting. Comprising coins crafted to the apex of Proof quality from .9999 fine gold, and distinguished by stunning one-year-only designs, the 2010 series is available in three exclusive formats. Strictly limited editions, just 1,000 $50 1/2oz, 2,500 $15 1/10oz and 25,000 $5 1/25oz 5-coin Proof collections have been struck for the global market! With the worldwide surge in demand for gold coins showing no signs of abating, and this series celebrating some of the most widely revered Australian native icons, the 2010 Discover Australia release is bound to be hotly pursued across the globe. 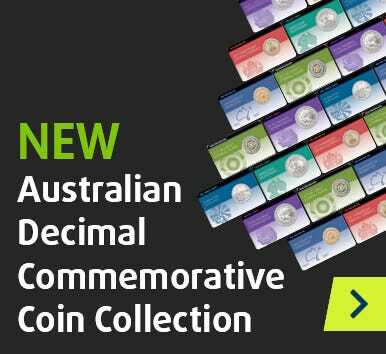 Typical of the quality of all Perth Mint presentations, each of these prestigious Australian legal tender collections is housed within an official case, complete with a numbered Certificate of Authenticity. With platinum more than 30 times rarer than gold, there are few coins struck in this prestigious precious metal issued anywhere in the world. And none as spectacular as the Perth Mint’s new 2010 Discover Australia Dreaming Platinum Proof Series! A seldom seen opportunity to add one of the world’s most desirable, rarest precious metals to your collection, this world-renowned program once again comprises two pure .9995 platinum sets. Underpinned by glorious full-colour, the 5-coin $15 1/10oz and $50 1/2oz platinum sets both pay homage to the same five Australian native icons honoured in the silver and gold collections – but are graced with radically different full-colour indigenous art designs! A release of immense prestige, beauty and limited availability, just 1,000 1/2oz and 2,500 1/10oz 5-coin collections are to be issued worldwide – each beautifully presented within an official case with a numbered Certificate of Authenticity.